Ever wonder how much electricity it takes to run a 13,500 horsepower pump? No? Me either. That is, until I found this power purchase contract from 2004 between the folks at Westinghouse Electric, in Newington, NH and Public Service Company of New Hampshire (PSNH). According to the document, Westinghouse has a special contract with PSNH for electricity to run its pump testing operation. These large pumps, up to 13,500 horsepower, are manufactured and tested at the Newington facility and are used in nuclear power plants around the world. So how much power does it take to run a 13,500 horsepower pump? According to this "surprising energy facts" website, about 10 megawatts. The website says that's just a tad shy of the 15,000 horsepower produced by a single 747 engine. I guess it's convenient that Westinghouse's Newington facility is just a few hundred yards away from not one, not two, but three power generating plants that together can produce almost 1,200 megawatts of electricity. That's a good thing because otherwise, I'm sure the lights around Newington would dim just a little bit each time Westinghouse fired up one of their 13,500 horsepower pumps for testing. Westinghouse Electric Company's 66,000 sq. ft Newington, NH facility manufactures components for nuclear power plants. 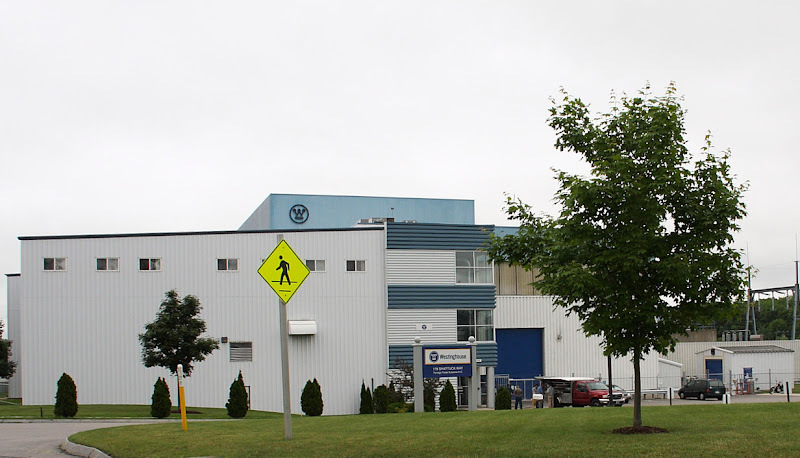 Westinghouse Electric is headquartered in Pennsylvania, but in Newington, around 220 workers are employed producing between $20 and $50 million dollars worth of nuclear power plant components each year. Westinghouse Electric is 77% owned by Toshiba, 20% owned by The Shaw Group, and 3% owned by Mitsubishi Heavy Industries. Westinghouse boasts on their web site that their designs are behind 50% of the 440 nuclear power plants in operation around the world today. I'm working on a post about the state of the nuclear power industry, but for now I'll just note that there seem to be three nuclear power plant designs currently vying for the various projects out for bid in the US, India, China, and elsewhere. These designs are the AP1000 from Westinghouse, the ESBWR and ABWR from GE-Hitachi, and the EPR from French owned Areva. 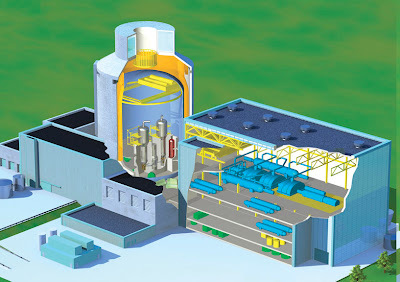 According to Westinghouse Electric's website, their their Newington plant manufactures reactor vessel internals, reactor coolant pumps, control element drive mechanisms, and pressure vessels of pumps and other components for nuclear power plants. This 2002 SeacoastOnline article by Nicholas Brown does a nice job of sizing up what they are making.